In the constellation Libra 20 light years there is a star with a interesting and important planetary system. 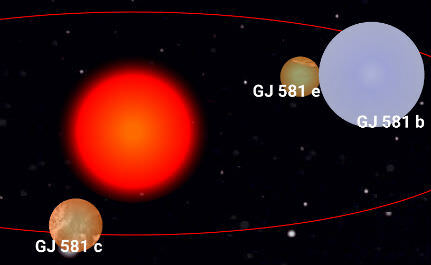 The star called Gliese 581.To find it in the Exoplanehunter app you need to search for the name GJ 581. Gliese 581 a red dwarf and is a third of the mass of the sun. The first planet that was discovered orbiting Gliese 581 was Gliese 581b in August 2005 a neptunian. The second planet discovered in the system was Gliese 581c in April 2007. The planet has a mass is bigger than Earth a so called Super Earth. Gliese 581 c was chosen for the message from Earth. From Ukraine's National Space Agency a high-powered digital radio signal was sent to the planet in october 2008 it will reach its destination first in 2029. The message contains images of landmarks,famous people like Hillary Clinton and notes written by Bebo members. Later it has been confirmed to be too hot for life. Another planet was discovered in 2007 in the star habitable zone but much more massive than earth Gliese 581d. Also a message was sent to Gliese 581d. A website "Hello from Earth" run by Cosmos magazine collected messages. The messages were later send from the DSS-43 70 m radio telescope at the Canberra Deep Space Communication Complex at Tidbinbilla, Australia, A study from 2012 concluded that Gliese 581 d is likely to be an result of stellar activity and does not exist. In April 2009 the third confirmed planet was reported Gliese 581e that was discovered by an Observatory of Geneva team led by the Swiss astrophysicist Michel Mayor. Gliese 581e has similar size as Earth but is even closer the star than Gliese 581c. At the end of September 2010, Steve Vogt a astrophysicist from UC Santa Cruz discovered Gliese 581 g he nicknamed the planet Zarmina after his wife. The discovery was a huge sensation at the time as it was the first earth-like exoplanet discovered in the habitable zone of a star. Researcher Paul Robertson studies concluded as Gliese 581g was detected from Gliese 581d orbit and Gliese 581d was false positive due to stellar activity. Other studies from by a research team led by Guillem Anglada-Escudé in 2015 claims that Gliese d could exist despite the stellar activity and that the data should be reanalyzed. Hypothetical say that Gliese 581 g does exist, how similar to earth is the planet and could there aliens? Gliese 581 g is very close to it sun. The planet will not rotate around its axis and always have the same side pointing toward it sun. On one side of the planet it is always day and on the other side always night. The atmosphere I dense and could support life if the planet has liquid water. Temperature between −31 °C and -12 °C or −12 F and 10 F as average could be hot on the day side and the most habitable area on the planet is between the line of day and night.